When I was in college there were times when one of us would go for a shot and our coach would say “don’t look for the easy way out. You have to earn your points and make them earn theirs.” He always said it when we went for a risky, low percentage shot in an important situation. He even said it when we made the shot because it was not a shot we could make often enough to justify going for it at all. Coach Seewagen had a saying. 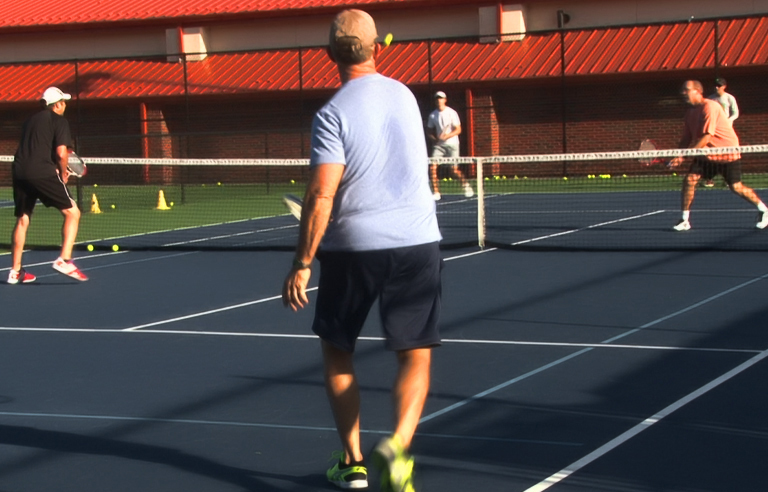 ” Don’t go for a shot in a match that you can’t make every time in practice.” That was the litmus test of what shots you should hit, and what shots you needed to work on in practice so that you could make them consistently. I don’t think a lot of tennis players think about the cumulative effect the way they play has on their opponents game. Every time you make your opponent hit another ball, you are testing their fitness and their resolve. When you watch Nadal play you can see how he physically tests his opponent, similar to how a boxer wears an opponent down with body blows. It is unwise to think that you can win a match with “knockout punches”. You have to “break their will” as we used to call it in college. We knew there would be a point where our opponent couldn’t take the constant physical and psychological pressure we put on them and they would snap like a twig and the errors would come in bunches. To do this you must be in great shape and develop the ability to play every point with maximum focus and energy. In doubles, the way you break down your opponents is by making a lot of set up shots and putting your opponents in difficult situations all the time by making good choices and being consistent. Your goal is to keep gaining an advantage until you force them to end the point. Again, there’s a cumulative effect to this. Last night I was playing doubles. One of the players on the other team is a very good, ranked player who has a lot of experience and savvy. I must have made him hit low volleys on 70% of my service returns. At 5-5 in the third set, he served to me at 30-40. Another low return and a volley that went long by 4 feet. He just couldn’t make another difficult volley at that point, especially under that kind of pressure. Nothing fancy, just keep testing them until they break. If they don’t break you’re giving youself a chance against a formidable opponent. It is much more difficult and impressive to be able to do good things consistently than to do spectacular things occasionally but most people are more impressed with shot making and glitz than true skill. You should want other players to describe your game with statements like: “They made it look so easy” or ” They just never missed” and “they never gave us a free point.” Sometimes opponents will use negative terms like ” all they did was get the ball back” but that just means they don’t understand the game or are unwilling to admit that the way they play is not conducive to being successful without help from their opponents. Don’t let those kind of negative statements bother you. Take them as a compliment. 1.) Negative situation (defensive). Your opponent has hit a ball at your feet and is closing in. Your goal is to get back to neutral by hitting a soft ball back at their feet. Don’t panic and don’t go for too much. 2.) Neutral situation. You are about to hit a mid court volley at waist height and your opponent is coming in behind their return. Take a little pace off the ball and keep it low while making them move to one side or the other. You now have the advantage and can be more aggressive on your next shot. 3.) Positive situation (offensive). Your opponent has popped the ball up and you are closing in. Add pace to the ball since it’s above the net and hit it to and open area of the court. Now even if they get to it they will probably miss or hit an even weaker shot.